The Angling Trust has been awarded a new contract to undertake essential angling services including tackling illegal angling and encouraging more people to go fishing across the country. Following a competitive procurement process, the Environment Agency awarded the contract as part of a continued drive to work with partners to ensure freshwater fisheries thrive and encourage more people to go angling throughout England. The contract will run for up to 4 years and is worth £1.15 million a year. It is funded by income from fishing licence sales. building effective enforcement partnerships with the police, angling clubs and fishery owners through the Voluntary Bailiff Service and Building Bridges project (aimed at educating and integrating migrant anglers about England’s angling laws and rules). These services complement the Environment Agency’s regulatory work to protect and improve fisheries through monitoring and managing fish stocks. This contract continues the Environment Agency’s commitment to work with partners to deliver our fisheries priorities for anglers. Through commissioning work with partners we aim to secure the best future for angling by making fishing licence income go further. We are delighted to be working with the Angling Trust on this endeavour. We are thrilled to have been awarded this contract and our ambition is to go above and beyond the requirements of the contract wherever possible. Both organisations are committed to protecting and improving freshwater angling. 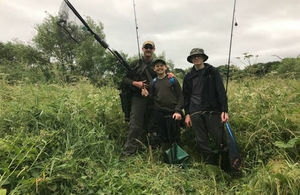 The Angling Trust offers a very cost-effective way of delivering this work because of our extensive network and unique access to match funding. The current National Angling Strategic Services contractual arrangements are due to end on 31st March 2019 and the new contract will commence on 1st April. The contract will initially be until 31st March 2021, with an option for a further 2 years. The contract was procured through an advert in the Official Journal of the European Union. Interested organisations who passed a pre-qualification questionnaire were formally invited to tender for the work. The award of the new contract was made on an evaluation of bids based on cost and technical quality. Negotiations continue with the Angling Trust on finalising the contractual arrangements for the new service.